The original Tomb Raider was more than just a 32 bit title that launched a strong Playstation franchise, it was a cultural phenomenon. For those that have ever played it, especially if you’ve recently gone back, it’s rather difficult to appreciate that game without the amazing strength of nostalgia. Fortunately when Crystal Dynamics took over for the franchise with Legend the company’s second project was to remake the original. As the following reviews will attest, it was a good faith effort to not only switch up the mechanics and polish the weaker points of the first game, but ultimately the need to keep many of the levels and designs intact tarnish the experience. Crystal Dynamics played it safe with how little it tweaked of the original formula and what resulted was a game that feels so updated and tight at some points and so sluggish and archaic at others. Right off the bat I have to confess that while I like the idea of Tomb Raider, I never really got into the series until Underworld. That title came much later than even Anniversary and basically forgets almost every staple the original Core franchise had. So I guess in a sense, I don’t really like the original concept or releases of Tomb Raider. I’ve also given Anniversary a go several times and always found myself quitting at some point in the campaign, which was always sooner than later. This time around for the game club I really was giving it a good faith effort, complete with a video series documenting the whole journey. 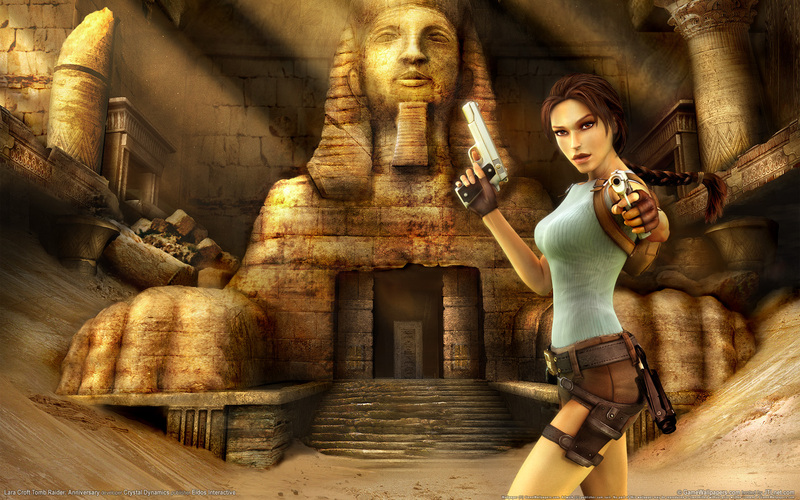 Unfortunately, Tomb Raider Anniversary seems doomed to consistently break me and by the time I was on the harder puzzles of Egypt I had to yet again throw in the towel. Whether it’s lack of patience, skill, or a combination of the two, I am not destined to ever complete or even be all that good at a classic Tomb Raider game and all of my biggest gripes with the game seem to be all of the fans’ favorite aspects. Agree to disagree seems to be my best choice. This updated version is, in a word, gorgeous. From an aesthetic standpoint the world of exploration with Lara Croft is redesigned with beautiful backdrops, long draw distance, minutia that comes to life, and an overall polish that wasn’t even remotely capable back in 1996. Where there used to be stretched textures, black backgrounds, and disappearing enemies there is now a living, breathing world that looks great (at least on PC) even today. Not only that but the soundtrack has also received a more robust facelift that is capable of reliving those stellar moments where drama and sound design collide, but also bring a familiar but higher quality soundtrack out of the original. It all blends together into a title that looks fantastic in screenshots and will impress when watching either gameplay demos or YouTube videos. It’s when you take this remarkable facelift and try to play a game with it that things start to fall apart. We’ve come a long way since the days in the original where you would walk to the edge of a ledge, jump back a few steps, and then take a running leap. 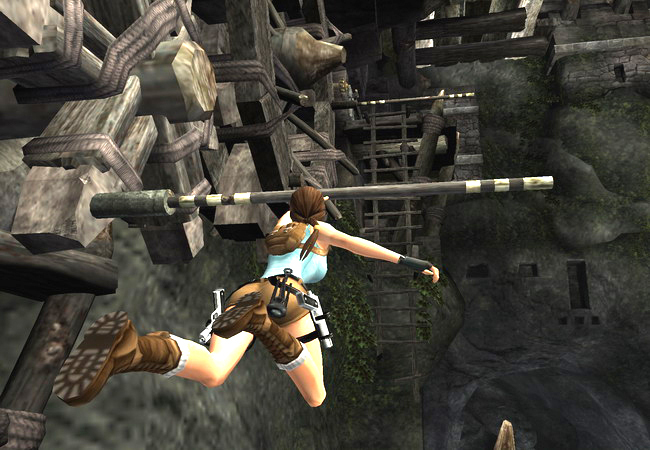 Nowadays Lara knows to grab for ledges, perform a running jump without suicidal falls, drop to a lower ledge with the push of a button, and basically control like a modern character. That is until she tries to interact with the environment. I don’t know (and frankly really don’t care) whether this is the result of lack of testing, the setback of perhaps using the original levels as blueprints, or just plain bad creative decisions but somehow in re-creating the original Crystal Dynamics managed to also recreate the frustrating task of figuring out where the hell to go and what the hell to do. Sure, series veterans will breeze through the challenges and no the exact route, but isn’t the point of a remake/re-imagining to attract new players? It makes no sense that she can walk, talk, and act just like most 3D platformers of 2006 but that her levels and interactions with those levels are still trapped in 1996. The same can also be said about some of the additions like the inclusion of the grappling hook from Legend, which now becomes the biggest gimmick and also biggest setback of this title. I have no idea who on the creative team thought that after 10 levels of using rings on the ceiling to swing across gaps that without any form of tutorial or notice they could turn that ceiling ring into a door we latch and pull on to open would make sense, but that’s what happens. In fact, of the handful of times I truly got stuck, it was always due to not being able to figure out the necessary task and never being given an indication on what to do. That’s not puzzle solving, it’s asking the player to read the designer’s mind, which was quite possibly the reason for the death of the adventure genre. In the end it all results in frustration, not knowing where to go or what to do, and then losing your mind when you finally know what needs to be done and have to do it. Some people think that 10-15 hours of this is their idea of a swell time, but this particular retro gamer cannot stand it. This isn’t to say that Tomb Raider Anniversary isn’t a good game, but rather that it doesn’t have an audience. I listen to my cohost Jam go back and forth about the things he loves about the original and hates about Anniversary and visa versa that I’m betting most fans of Tomb Raider deal with as well. If you find yourself wondering whether or not the new one is any better, it was probably an unnecessary remake that fans won’t need in their lives. On the other hand for new players – especially ones like me that won’t even start the original game these days – the remnants of the old game and poor implementation of new mechanics leaves them in the same rut. Circling back to the original concept, it may be the case that Tomb Raider was just a game that was a snapshot in time and best to be left alone. Either way, I don’t think it’s a bad game from a tech standpoint, it just is a completely incompatible game for a player like me. I was on quite the mission this game club I played all the way through the original Tomb Raider and then I decided to tackle Tomb Raider Anniversary on PS2 and PSP (because the PSP is just a great system). After conquering the classic Playstation version I was actually quite excited to play this game since it was a re imagining of the first game. In this review I will discuss my thoughts on the game as well as briefly compare the PS2 and PSP versions since I was crazy and played both for the game club. 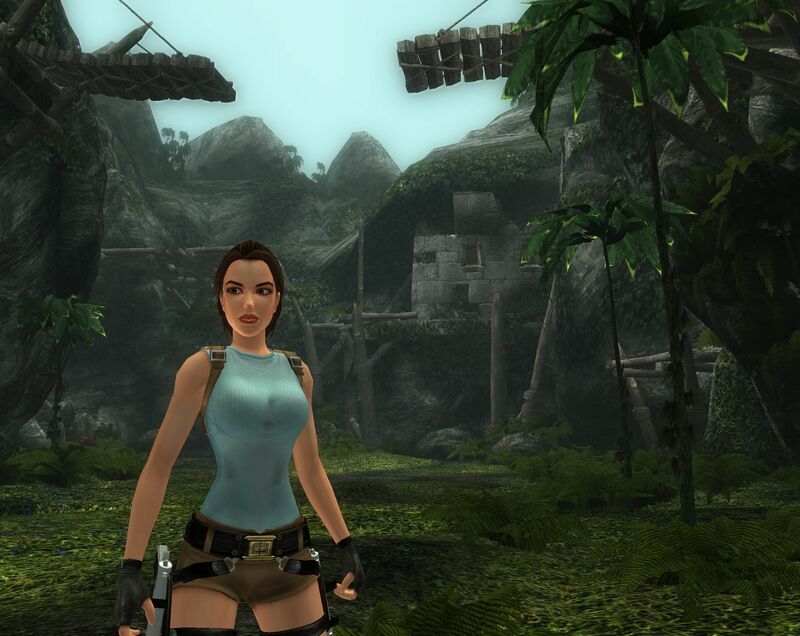 Lara and the levels get a very fine graphical make over. The game looks great, environments look more real and enemies look surprisingly terrifying this time. The animals seem to look a lot more demonic this time. The bears in particular don’t look like the sort of beast you want to run up to and cuddle. Yeah, I’m nostalgic for those horrible blocky graphics but the developers did a great job re making these levels. It was a lot of fun playing this after playing the original as you could view the changes to some of the more iconic moments from the first game. It’s just a shame they decided to shove basketballs under Laras top this time around. I get it Lara was designed to be disproportionate in the original game and lack realism. For a game that looks as good as Anniversary its a shame the developers didn’t decide at this point to make Lara appear more realistic. Fortunately Crystal Dynamics finally corrected this terrible design in the reboot of the series. 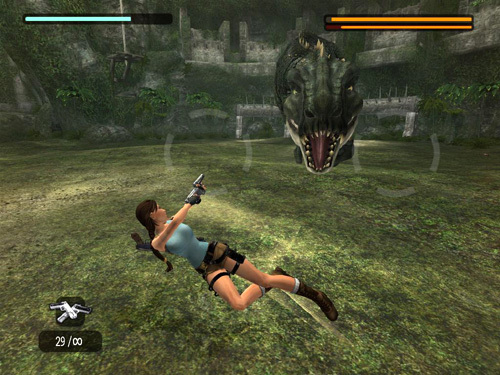 The game is based of the same engine as Tomb Raider: Legend. This means the game now moves a lot faster. The developers finally cut out all that jump calculating from the original in exchange for a lot of monkey climbing. Lara is a lot looser on her feet now, no more walking to edges just jumping around like a loon. Everything has been built to move quicker. You also have some of the mechanics from Legend carry over like the grapple hook which was never present in the original. The platforming works well but you’ll still find yourself dying constantly from not jumping to the right ledge or being caught by traps. They add a surprising amount of jumping sections in this game I like to call “pot luck jumpyness” an example of this is you will be presented with a insane jump puzzle where you have to lead from pillar to pillar while spinning saws are going on the walls as well as timed crushing blocks fall from the ceiling. Its just a bit too crazy and very hard to time a safe route. So I found I just jump and hope for the best. This did not feel fun. Fortunately there are regular checkpoints this time so there really wasn’t a lot of backtracking. I still found I died far more times in this game than I did in the original and while that may just be due to my poor performance and probably not playing the game the way it should be played, I just was not enjoying myself. The shooting mechanics also received a update you can collect all the weapons from the original but I found no matter what weapon I used it made little difference in taking the creatures down. The game also turns a lot of the games infamous enemy encounters into full blown boss battles. This was quite a clever design choice as you had to perform more steps than just shoot the hell of the boss until it dies. The problem is these obligatory steps are compulsory to damage the boss asking all other weapons other than the pistols pretty pointless. Regular enemies in this game are also bullet sponges they take far too long to take down. You can now do this head shot mechanic which speeds this up but it feels very tacked on and out of place. With Anniversary being developed during the boom of the “quick time event,” game design era the developers felt it very important to put this utter terrible mechanic into this game also. Once again I found certain iconic scenes from the original game where just ruined with the inclusion of this mechanic. You never fight a human character in this game, you just have to pass a quick time event. The main score of this game has been re worked and its a nice homage to the original music from the first game. Unlike the first game music is now a main focus, music fires off more regularly this time which looses a lot of that creepy tension from the original, but overall I very impressed with the changes that were made. Overall, I ended up finishing Tomb Raider: Anniversary quite disappointed. Although some of my main issues from the original where addressed like implementing regular check points. I still found this game very frustrating possibly more so than the original. It’s also a shame to see some of the most memorable action scenes in the original reduced to tedious quick time events. It’s sad really as Anniversary had a great opportunity to pull a Resident Evil on the Gamecube moment where it takes what works from the original and enhances it. Anniversary finds itself clearly attempting to appeal to new and old fans but ends up puling in the wrong directions. All that frustration we had in the original just seems to be added to here. At the end of the day Anniversary looks pretty but lacks spirit. Despite my opinion newcomers will probably find Anniversary a easier pill to swallow than the original. Comparing the PSP and PS2 versions. Surprisingly I actually preferred the controls for the PSP, when you jump towards ledges Lara will automatically latch on to them. In the PS2 version you have to hold down the R2 button. This not only added to the complexity of the controls but it didn’t always work. Unfortunately the R2 doubles as the walk button so if you hold it down too early its just a recipe for disaster. The controls for the PSP have been simplified as the system has less buttons than the dual shock controller on PS2. The main advantage the PS2 has over the PS2 is you have far better control of the camera with the right stick. The graphics on the PSP also feel more polished. That may be due to the fact I played the PS2 on a TV with resolution it wasn’t designed for, but even on a standard definition TV it very much lacks the definition of the PSP. Gun mechanics are more automatic which actually is a bit of a pain. 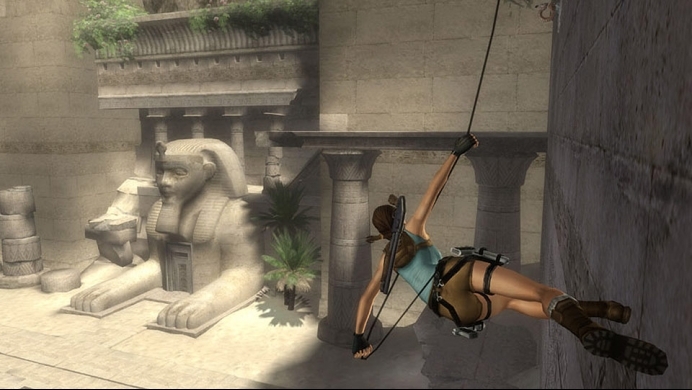 Lara will just aim towards the nearest target (like the original game), you can switch targets but its not as simple as it was with the the PS2 version. There are a few rare platforming sections in the game that have actually been altered on the PSP. They are slightly more simplified compared to the PS2 version. This is very rare and almost noticeable, had I not literally played the games back to back I may not have even picked up on this. Overall, there really wasn’t a lot of difference between each version. I felt the PSP version just gets the slight edge due to its automatic platform grappling. Its made certain platforming sections so much easier compared to the PS2 version. But at the end of the day I managed to get through the game quite comfortably on both versions. 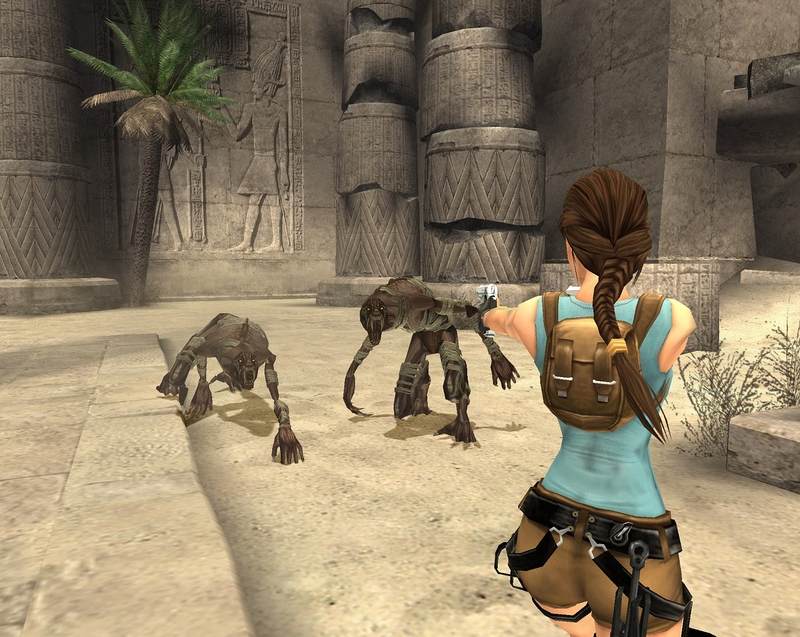 When you take a look at the Wii version, the only big concession there is that you need to use the Wiimote to aim at enemies, which has never been required in a Tomb Raider game and as Anniversary proves, simply shouldn’t be a mechanic. On the other hand since the game only utilizes one stick it’s much easier to navigate as we see in the PSP version as well. The 360 version is merely an upscaled port borrowed from the same engine that moved Legend from PSP to 360. As expected the PC version is just a gorgeous 1080p 60 fps rendering of the base game, which yet again stems from the roots of the original PSP title as well. If you’ve ever wondered how high quality the original assets of these later PSP/PS2 games was, clearly it was at least 1080p, which makes for impressive PC ports nowadays. Want to know more about the development, gameplay, or release information? Check out our profile page.